Holiday eye-candy – with fiber! The 44th Annual Juried Fiber Arts Exhibition at SAY Si is a holiday treat for any art lover. It’s surprising, innovative, and inspiring. The theme, ‘All Things Possible in Fiber Art’, called on artists to explore boundaries beyond their normal comfort zones. 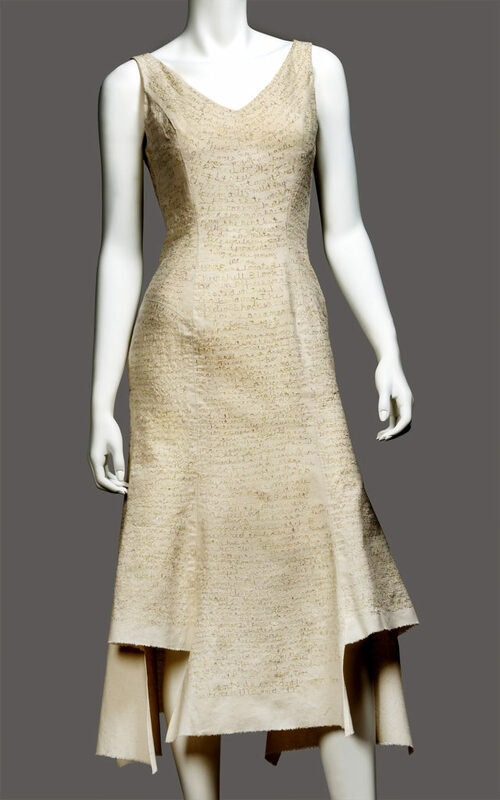 All types of fiber art were eligible, including 3-D, free standing, and art-to-wear. Juror Alana J Coates, a gallerist, educator, and curator who is academically trained in Art History, Museum Studies, and Nonprofit Leadership, made some intriguing choices for both inclusions and awards.The back-stories are important – read on. 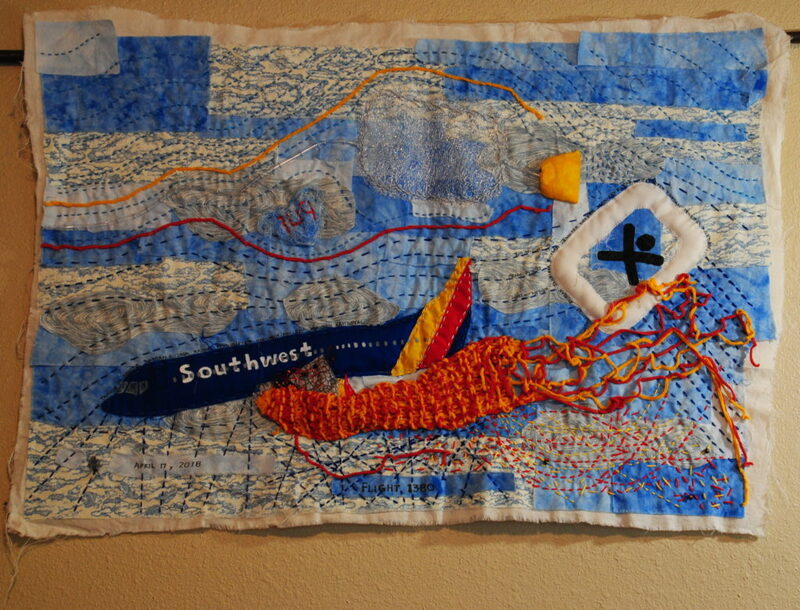 First place went to fiber artist Kathy Puente for her piece titled Flight 1380, a hand-embroidered homage to the April 17, 2018 Southwest Airlines tragedy in which the plane’s left engine exploded after one of its fan blades broke off. A gust of shrapnel blew out a window, partly sucking one passenger in Row 14 headfirst into the sky. Second place went to veteran artist and designer Caryl Gaubatz for her garment titled #MeToo. Subtle details like the uneven hemline with its metaphoric cutouts are clarified in the machine-embroidered dialog on sexual harassment contained in the fabric. It’s a meticulous art piece that requires close examination to fully appreciate its impact. And I’m happy to report that “Nine Antlers,” my piece inspired by the prehistoric archaeological remains of a young woman near Olmos Basin, won the Mixed Fiber Award. You can view the entire catalog here – food for thought, delights for the artistic spirit, inspiration for the new year. 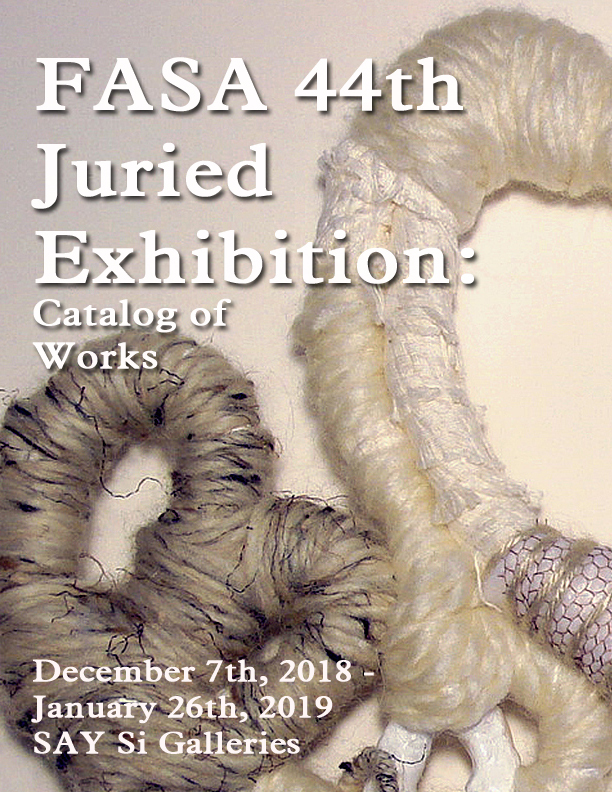 The FASA 44th Annual Fiber Art Exhibit 2018 opened at SAY Si on December 7th, 2018 and will show until January 25th, 2019. The SAY Si Gallery is located at 1518 S. Alamo St., San Antonio, TX 78204. This entry was posted in art show, Mixed Media and tagged fiber art by lynbelisle. Bookmark the permalink. Congratulations!!! It is an awesome piece! Great review of a beautiful show. Congrats on your well deserved honor. Either of your pieces could have been selected, talented lady! Thank you for this gift of your time and talent … I look forward to sharing the catalog. And I join with others in offering kudos for Nine Antlers … and for the equally wonderful Boro Horse! Well deserved and congratulations for this piece of art has the ability to transfix the observer to reach deep down within. Congratulations Lyn! I love this piece too. Happy Holiday.